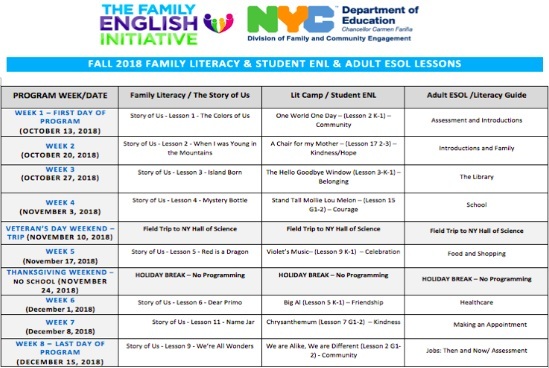 Family English is a unique program designed to help K-2nd Grade English Language Learners (ELLs) and their parents learn English as a family. By improving English language skills, Family English helps families build the confidence, relationships, and tools they need to be active partners in their child’s education. Help limited-English proficient families support their child’s learning at home. Help parents with limited English proficiency develop relationships at their child’s school. Additionally, families gather together for breakfast and lunch (provided) before and after the lessons. Child care is provided for PreK-aged siblings. These innovative program arrangements support families and allow them to spend their Saturdays engaged in quality literacy instruction. Over 750 students and families have participated to date! The majority of participants are P.S. 120 students, but other schools served include: P.S. 20Q, P.S. 22Q, P.S. 24Q, P.S. 32Q, P.S. 162Q, P.S. 196Q, P.S. 213Q., P.S. 214Q, P.S. 242Q, P.S. 244Q. Parents/caregivers complete pre and post surveys. This allows us to obtain baseline data and determine whether the program is helping them to learn new skills to support their students, and also increase their own comfort and confidence in engaging with their student, the school and teachers regarding their child’s learning and progress. Teachers receive formal/informal observations on their instruction and overall implementation of the curricula both by our site coordinator and our instructional coach (consultant). This fall teachers began using a checklist to assess each student’s ability to identify story elements (beginning, middle, and end of the program) to obtain data on their progress.